There was a large turnout this morning to remember Laurel Stevens who sadly passed away recently. She was a syndicate owner of both She's Humble and Itoldyou, and she loved her Saturday breakfast visits to the yard. After a few words, glasses of champagne were raised in her memory. All Blue But Everyone Happy! 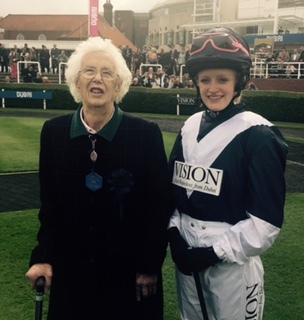 Owner Rosemary Watson had a great day out at Newmarket yesterday with her friend Linda Beasley. Rosemary had lent her horse, Fine Tune, to take part in the second ever running of the Varsity Horse Race. 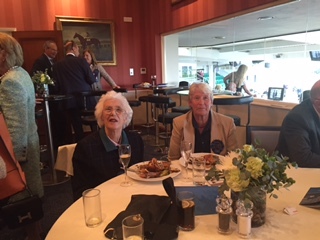 In return they had a splendid day with lunch in the Royal Box. The day was made even better when Oliver won his first ever "Best Turned Out" award. £100! 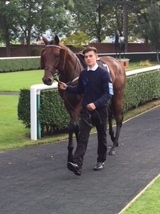 Fine Tune was ridden for Oxford by Alice Thomson. They finished mid-division and unfortunately Cambridge won the trophy. Rosemary and Alice before the race.